JSS Academy of Higher Education & Research (JSS AHER) has done the city proud by bagging the 37th rank among Universities in the country and third in the State of Karnataka. This is the only institution from Mysuru to make it to the national ranking list and it has maintained its position among top 50 Universities of India continuously for the third time. Meanwhile, JSS College of Pharmacy, Mysuru, is ranked 10th among 346 colleges in the country and second in Karnataka. The JSS College of Pharmacy, Ooty, is ranked 15th in the country and first in Tamil Nadu. 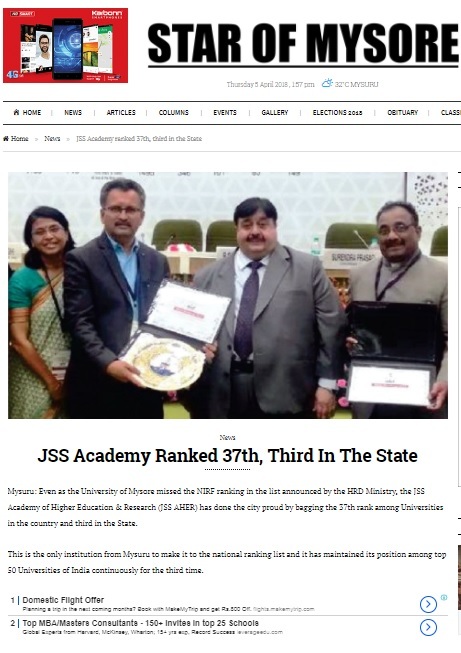 JSS Academy of Higher Education and Research, which is based out of Mysuru, has been ranked 37th among the universities in India. It was ranked 45th in the country last year. 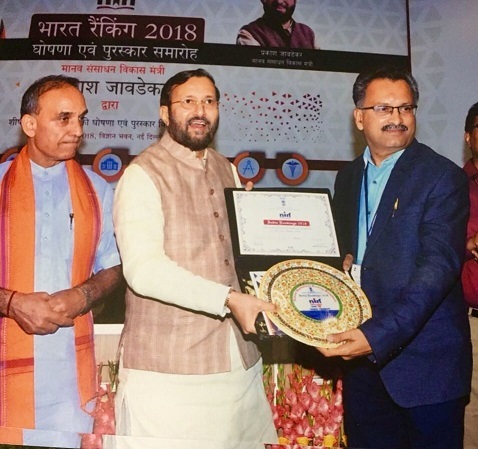 It is also ranked 59th best educational institution overall in the country this year as against 74th rank secured in 2017. A release from the academy said this is the only institution from Mysuru to make it to the national list and has retained its position among the top 50 universities continuously since the last three years. It said JSS College of Pharmacy in Mysuru was also ranked 10th in the country out of 346 colleges while its sister institute – the JSS College of Pharmacy at Ooty – was ranked 15th. 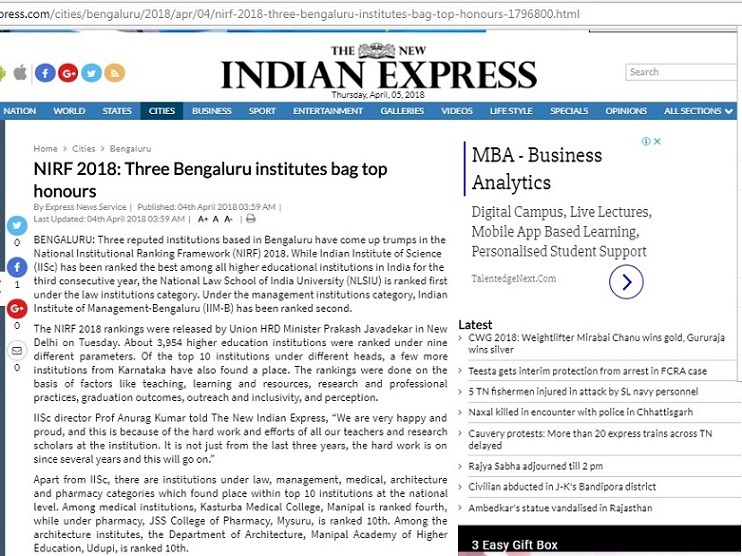 BENGALURU: Three reputed institutions based in Bengaluru have come up trumps in the National Institutional Ranking Framework (NIRF) 2018. While Indian Institute of Science (IISc) has been ranked the best among all higher educational institutions in India for the third consecutive year, the National Law School of India University (NLSIU) is ranked first under the law institutions category. Under the management institutions category, Indian Institute of Management-Bengaluru (IIM-B) has been ranked second. Apart from IISc, there are institutions under law, management, medical, architecture and pharmacy categories which found place within top 10 institutions at the national level. Among medical institutions, Kasturba Medical College, Manipal is ranked fourth, while under pharmacy, JSS College of Pharmacy, Mysuru, is ranked 10th. Among the architecture institutes, the Department of Architecture, Manipal Academy of Higher Education, Udupi, is ranked 10th. Research scholars at IISc, however, said they were expecting the top ranking. “IISc is on the top for the last two years and it was expected this year too,” said a faculty member.